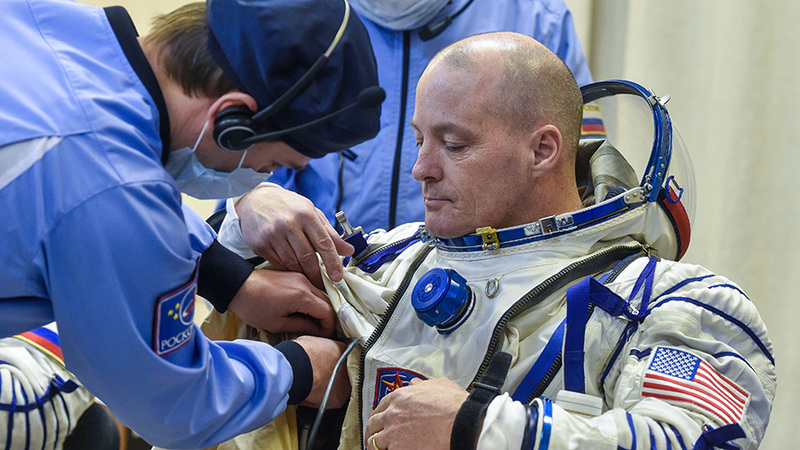 NASA astronaut Scott Tingle is helped into his Russian Sokol spacesuit as he prepares for his Soyuz launch to the International Space Station on Sunday, Dec. 17, 2017 in Baikonur, Kazakhstan. Our crew just finished the final training event before the launch. Tomorrow, at 13:20 local time (Baikonur), we will strap the Soyuz MS-07 spacecraft to our backs and fly it to low Earth orbit. We will spend 2.5 days in low Earth orbit before docking to the MRM-1 docking port on the International Space Station (ISS). There we will begin approximately 168 days of maintenance, service, and science aboard one of the greatest engineering marvels that humans have ever created. Today was bittersweet. Ending a 2-year process of intense training was welcomed by all of us. We are very tired. Seeing our families for the last time was difficult. I am pretty lucky, though. My wife, Raynette, and the kids have grown up around military service and are conditioned to endure the time spent apart during extended calls-to-duty. We are also very much anticipating the good times we will have upon my return in June. Sean and Amy showed me a few videos of them mucking it up at Red Square before flying out to Baikonur. Eric was impressed with the Russian guards marching in to relieve the watch at Red Square. Raynette was taking it all in stride and did not seem surprised by any of it. I think I might have a family of mutants who are comfortable anywhere. Nice! And, by the way, I am VERY proud of all of them! Expedition 54 flight engineer Norishige Kanai of Japan Aerospace Exploration Agency (JAXA), left, Soyuz Commander Anton Shkaplerov of Roscosmos, center, and flight engineer Scott Tingle of NASA are seen as they depart Building 254 and report to mission managers ahead of their launch to the International Space Station Sunday on Dec. 17, 2017 at the Baikonur Cosmodrome in Kazakhstan. Tomorrow’s schedule includes a wake-up at 04:00, followed by an immediate medical exam and light breakfast. 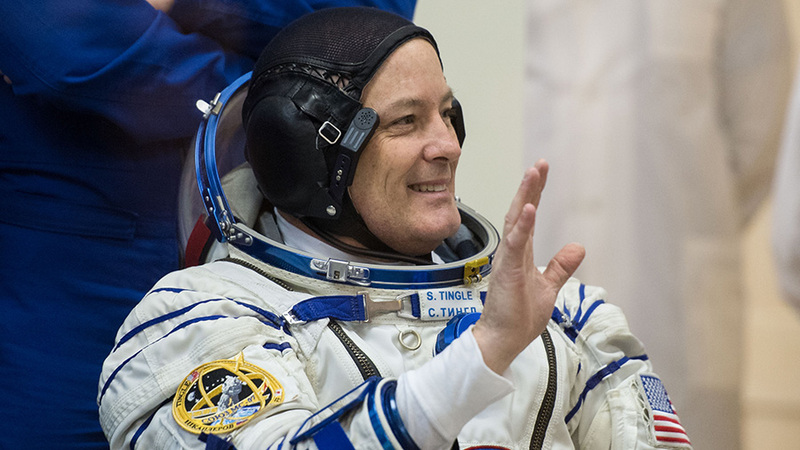 Upon returning to our quarters, we will undergo a few simple medical procedures that should help make the 2.5-day journey to ISS a little more comfortable. I’ve begun prepping with motion sickness medication that should limit the nausea associated with the first phases of spaceflight. I will continue this effort through docking. This being my first flight, I’m not sure how my body will respond and am taking all precautions to maintain a good working capability. The commander will need my help operating the vehicle, and I need to not be puking into a bag during the busy times. 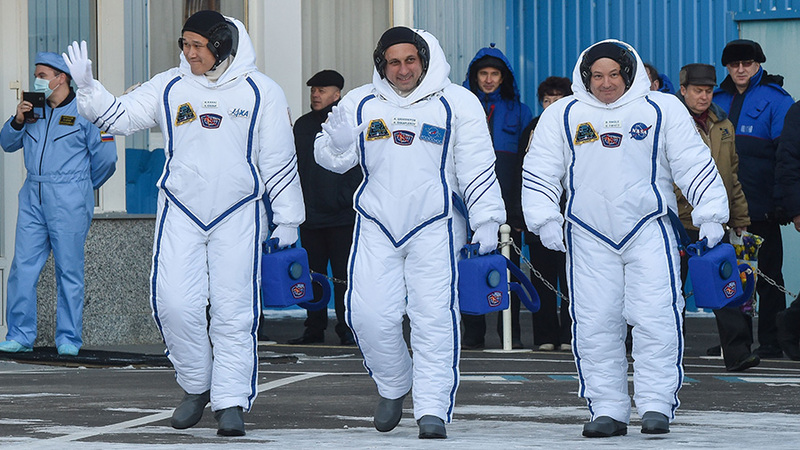 We suit up at 09:30 and then report to the State Commission as “Готовы к Полёту”, or “Ready for Flight”. We’ll enter the bus, wave goodbye to our friends and family, and then head out to the launch pad. Approximately 2 kilometers from the launch pad, the bus will stop. The crew will get out, pee on the bus’s tire, and then complete the last part of the drive to the launch pad. This is a traditional event first done by Yuri Gagarin during his historic first flight and repeated in his honor to this day. We will then strap in and prepare the systems for launch. Next is a waiting game of approximately 2 hours. Ouch. The crew provided five songs each to help pass the time. My playlist included “Born to Run” (Springsteen), “Sweet Child O’ Mine” (Guns and Roses), “Cliffs of Dover” (Eric Johnson), “More than a Feeling” (Boston), and “Touch the Sky” (Rainbow Bridge, Russian). Launch will happen precisely at 13:20. I think this sets the stage. It’s 21:30, only 6.5 hours until duty calls. Time to get some sleep. If I could only lower my level of excitement!